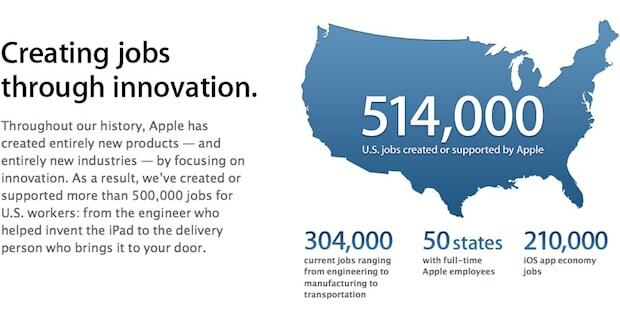 In its latest effort to overhaul its public image, Apple has created a special website detailing its positive impact on the U.S. economy in terms of job creation. The personal electronics giant says it supports 514,000 jobs domestically. Apple, of course, has faced many tough questions about the jobs its sent overseas, particular those at massive factories in China. The American jobs cited by the company include 47,000 at Apple itself and 257,000 at Apple partners like FedEx and Corning Glass. Apple also points to the so-called "app economy," with 210,000 people currently working on thousands of iOS apps.